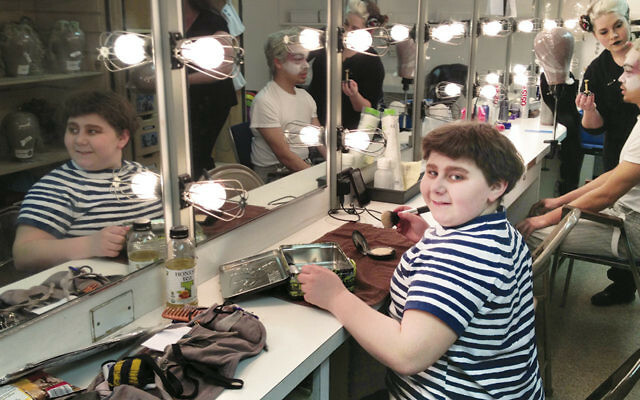 Jeremy Shinder gets ready to play Pugsley in the “Addams Family. 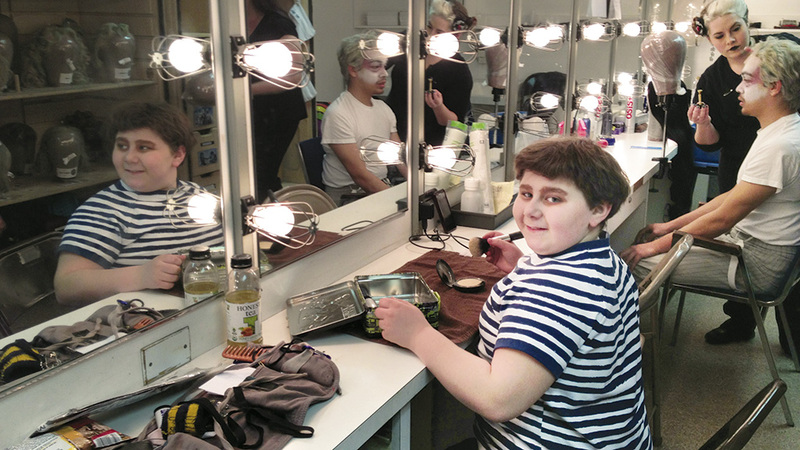 Haworth teen and stage performer Jeremy Shinder had his first gig when he was 2. It was when his grandfather, Rabbi Frederic Pomerantz, called him up to the bimah to play drums at Temple Beth-El of Northern Valley in Closter. 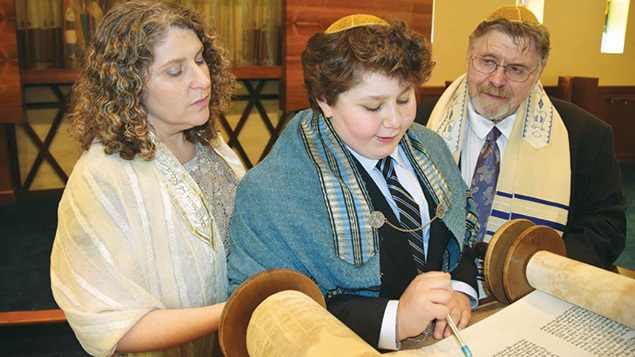 It is fitting, then, that his recent bar mitzvah celebration — which included a benefit concert for Equity Fights AIDS — took place at that same synagogue. In fact, his bar mitzvah spanned two synagogues, said his mother, Rabbi Rebecca Shinder, religious leader of Temple Beth Shalom in Florida, N.Y., and associate rabbi at Tenafly’s Temple Sinai for many years. What was it like to grow up surrounded by rabbis? “You had to pay attention in Hebrew school,” said Jeremy. His efforts clearly paid off. Jeremy Shinder with his mother and father preparing for his bar mitzvah. “We came back into the sanctuary and had a concert in which the kids” — all young people with whom Jeremy had worked — “did some group songs and solo songs. Jeremy also gave a talk about why he did it, and thanked corporate sponsors and individuals givers. He talked about performing a mitzvah being part of a bar mitzvah.” So far, Jeremy has been able to donate nearly $3,600 to his designated charity. He had set out to raise $1,800. 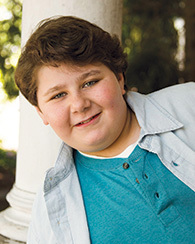 The teen’s acting career began with a local talent search at the Kaplen JCC on the Palisades, where he continues to work with Deborah Roberts and Amelia DeMayo. It was his grandmother who insisted that he try out. “It started with my uncle,” Jeremy said. “He always wanted to be an actor, but my grandma didn’t allow it.” Jeremy is named for that uncle, who died of AIDS when he was 30 years old. Jeremy’s bar mitzvah took place on June 13, his uncle’s birthday. “When my mother saw the ad [for the JCC tryout], she said don’t make the same mistake I did. You can’t say no. From there, she said, her son’s career blossomed. His first job — while he was in nursery school — was for Nickelodeon. Now, at 13, he has under his belt a Broadway show as well as an extended tour, an appearance on Sesame Street, bit parts on TV shows, commercials, and an independent film, and countless Shabbats spent playing drums at musical services. His schoolwork has not suffered. “When I was in ‘Christmas Story,’ I had two phenomenal tutors,” Jeremy said. “They have become my personal tutors ever since. I always request them and get them.” He noted that his mother was going to tutor a fellow actor — a student at a Solomon Schechter school — but the arrangement did not work out. Jeremy is a showman, Rabbi Shinder said. Like her father — a longtime rabbi who never looked at his sermon but preached from memory — “Jeremy didn’t look down at the notes for his bar mitzvah speech.” Calling her son “like Nathan Lane in tap shoes,” she described him as a “unique person. He’s a boy and a comedian and has a unique look.” He does, in fact, tap dance. Jeremy called Broadway Cares: Equity Fights AIDS “the leading industry-based HIV/AIDS fundraising and grant-making program in the country. They run social services in all 50 states.” To raise funds, he opened a page on the group’s website, donate.broadwaycares.org/jshinderbarmitzvah.